We also sent one horse on to his new home, and welcomed one in to our home. We took on “Wiley” (not his real name) from his previous owner as he was not a good fit for her, and he was developing some bad habits. Without anybody interested in buying him for the price she wanted, he was destined for a sadder fate – the auction house, which would have been a waste for such a talented and well bred horse. We bought him ourselves, just to give him a shot at another chance. He spent a few weeks with us, and all we really did was let him be a horse. He ate grass and hay instead of grain and hot feed, and he spent his days out in the field with Sunshine and Beau. He bullied them both, and generally threw his weight around, which was gaining by the day. 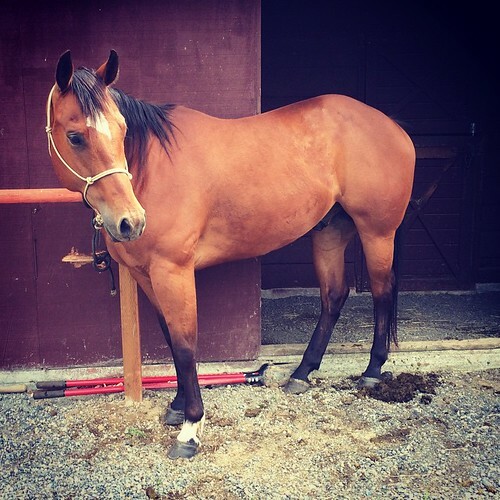 He filled out and started to look like the prestigious quarter horse his papers say he is. 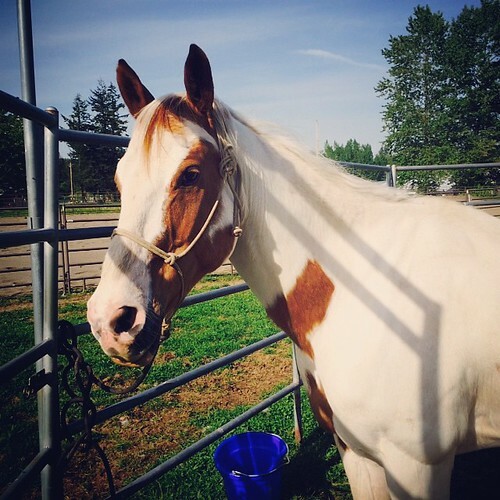 We found the right home for him – as a working ranch horse for a Chilean cowboy over in Eastern Washington, where he will get the kind of work he will thrive on. He will develop a work ethic and have tasks to put his considerable mind to. He gets bored easily, and needs a full time job. An hour a day was not going to cut it for this guy, so to learn that he is going to be an all-day horse is great news. He will learn to rope and work cattle, and do whatever else is needed. Generally, he gets to go and be a grown up horse at last. It felt good to see him leave in a trailer and know that he isn’t headed for the auction. Before he left, he managed to dig a huge hole in our gravel driveway where we left him tied for half an hour, so I can’t say I’m that sad to see him go. He will soon learn that being destructive is a waste of energy, and I’m sure he will learn to enjoy the downtime that comes with standing tied. We were gifted a horse by a friend of ours as a wedding present, and he arrived over the weekend too. We went to pick him up from his current home, where he wasn’t getting any work or attention as the family had lost interest in horses and didn’t have the time to spend with him. Known as “Fleck” to our friend, this guy is older – about 15 – and has been there and done that. He has raised several kids and taught them to ride, and has been a western horse and an English horse. The first thing he needs from us is some TLC. I took an hour and brushed out most of his winter coat that was still stuck in his hair, and then he was able to roll and get to his own skin properly. His feet are a bit of a mess, so Cowboy will have to take some time to trim him properly to correct the issues. He’s underweight and has almost no muscle definition, so we will be feeding him up on our good spring grass and exercising him to build up his muscles again. I’m excited to see the transformation in him – rumour has it he is built like a tank when he is in good shape. It’s exciting to me to have a horse in our herd that might be a good fit for visitors, beginners, and the like. Sunshine does a good job of looking after beginners, but it means I don’t have a horse to ride while she’s being used. Fleck, or “Mr T” as I tend to call him (his registered name is Tailor Made Magnum), has fitted in just fine with Sunshine and Beau, and it is lovely to have him as part of our herd. I can’t wait to get to know him better. By the way, Sunshine and I are coming along leaps and bounds in our work together. It is terribly exciting. Cowboy is excited about it too, as he has been trying to get us to see our progress for a long time. I’m only just feeling it for myself.